As part of our air quality campaign, we want to encourage drivers not to leave their engines running whilst stationary. Please send us your suggestions for the best places to talk to them and hand out anti-idling leaflets. Thursday 11th April – Elections 2019 Joint Hustings . 7-9pm. We've teamed up with Portsmouth Cycle Forum Come to our local election hustings to find out how local political parties propose to improve air quality and congestion for Portsmouth residents, with particular reference to the role that cycling, walking and public transport can help. Everyone is welcome. Bring your questions to ask the panel. Monday 15th April – Portsmouth Friends of the Earth AGM . 7.30pm (Doors open at 7pm). Find out about our activities over the past year and contribute ideas for future campaigns. All welcome. Refreshments will be provided. The Community Space, Tesco Extra, Fratton Park. Thanks for reading our news. We hope to see you at one of our events! Scroll down to read about other green events happening this month that you might be interested in. Wednesday 3rd April – Fashion Revolution Clothes Swap . 12-2 Drop off unwanted clothes & accessories at the Eldon or Nuffield Buildings on 2 April from 9–11am or bring them to the Clothes Swap. For every item, you get a ticket and then you can take away the same number of items during the swap. Saturday 6th April – Focus Group: Gardens, Windows & Balconies in Portsmouth , 2-4pm. Are you aged between 18 and 65, live in Portsmouth and have a small garden, window box or balcony? If so, the Hampshire & Isle of Wight would like to speak to you about how you use your garden or outdoor space. Saturday 6th April – Southsea beach clean , 10:30-12:30 with Surfers Against Sewage. Meet up at South Parade Pier. Tuesday 9th April – Turning the Tide - artists reaction to pollution in the sea , 10-4pm A collection of artwork from local art groups and students exploring sea pollution at Explosion! Museum of Naval Firepower, Gosport PO12 4LE . Thursday 11th April – Portsmouth Green Drinks , 7:30pm at Stephen Morgan MP's Office 72, Albert Road, Southsea. He'll be asked to give insights into how as local campaigners and residents, we can best influence national government/ MPs/ policy groups etc. Friday 12th April – Portsmouth YouthStrike4Climate - 3rd Strike , 11-2pm in Guildhall Square. Come and show your support for young people demonstrating to demand change. Saturday 20th April – Repair Café Portsmouth , 10:30am - 1pm at Buckland URC, 174 Kingston Road, Fratton, PO2 7LP. This is a free repair service for your broken appliances, stuck zips, rusty tools, old bicycles and holey jumpers. Saturday 20th April – Portsmouth Vegan Festival , 10:30-4:30pm in Portsmouth Guildhall. Enjoy more than 80 stalls, world food caterers, catering demonstrations, talks and much more. £3 entry on the day (under 16s free) or £15 VIP tickets in advance. Tuesday 23rd April – Wildflower Walk , 7pm Join Friends of the Langstone Harbour for a 2.5 mile walk to try to find some wildflowers and birds. Meet in the lay-by off Ferry Lane, Sinah PO11 0BZ. Friday 26th April – Zero Waste Portsmouth Monthly Meeting , 6-8pm in the Makers' Guild, Upper Second Floor, the Guildhall Portsmouth. Come and meet other people who want to reduce their waste. Saturday 27th April – Southsea Wildlife Watch , 12 at Cumberland House Nature Museum, Eastern Parade, Southsea PO4 9RF. This is for 5-15-year olds with the emphasis on family learning. Suggested donation £5 per child. Tuesday 30th April – Walk on Butser Hill and into Grandfather’s Bottom , 7pm Join Friends of Langstone Harbour for this walk to enjoy the wildflowers of the chalk downland. Dogs on leads welome. Suggested donation £1.50. Meet in Limekiln Lane on the approach to the Butser Hill carpark. Sign Friends of the Earth petition Will you ask the Prime Minister to make sure the UK radically cuts its greenhouse gas emissions to protect the natural world? Sign Green Peace petition Climate scientists say that we need to get off fossil fuels and shift to clean renewable energy as quickly as possible if we're going to avoid irreversible catastrophic climate change. We already have more existing oil reserves than our planet can afford for us to burn. New oil should be totally and permanently off limits! We’ve published a report, ‘Streets for People’ that sets out local people’s vision for Portsmouth streets as places that are people-friendly and not dominated by cars. 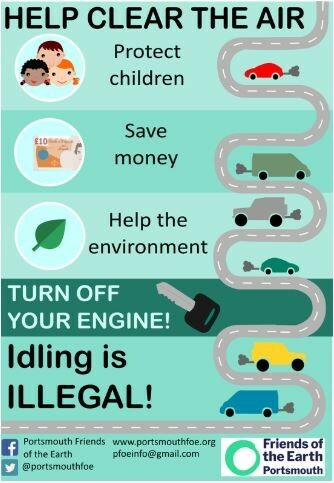 Anti-Idling Campaign We’re encouraging drivers to turn off their engines whilst stationary in order to improve air quality in our city. Download and print our Help Clear the Air poster to put in your window and get the message across in your street. If you don't have a colour printer, email us and we'll get a poster to you. The garden is next to Cumberland House​, the Natural History Museum on Eastern Parade. Our main gate is on the south side, facing the sea and opposite the children’s play area.